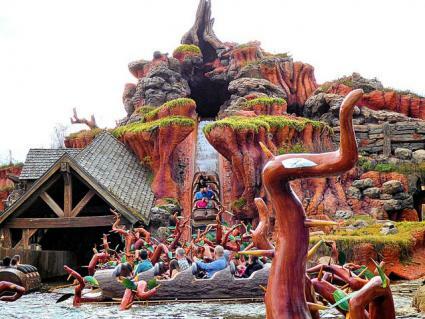 Splash Mountain isn't your typical water adventure ride. Using elements from the film Song of the South, including animation and songs, this Disney ride tells the classic tale of Br'er Fox and the cunning Br'er Rabbit. Here's a tip, though. Beware when the rabbit finally tricks his foe. Someone's going to take a huge drop into the brier patch! The ride starts with a small drop downSlippin' Falls before entering the cave-like area, as well as the tale of Br'er Rabbit's adventures as he looks for his Laughing Place. Continuously dodging his enemies, Br'er Bear and Br'er Fox, Br'er Rabbit narrowly escapes being tossed into a briar patch. Unfortunately, riders aren't so lucky. Splash Mountain culminates with a five-storey, 47-degree drop at Chick-A-Din-Hill at speeds of up to 40 mph. This combination of happily singing woodland creatures and a dramatic waterfall plummet has made Splash Mountain one of the most popular rides at the Disneyland Resort since its opening almost 20 years ago. Some of the animatronics found inside of Splash Mountain are from another legendary Disney attraction, America Sings. This former ride closed shortly before Splash Mountain opened, and due to budget constraints, many of the animal characters were "re-cast" into their current roles inside of the ride. Die hard Disney fans are able to point out the remaining characters from America Sings, and many enjoy reliving this part of Disney history as they take a float down Splash Mountain. "This is one fantastic ride!" said one reviewer. "From the animatronics, to the music, I love how there are happy, cheerful, smiling animals, and chipper music, and then as you get closer to the drop, the ride turns sad, depressing, and gloomy, with dreary music." Splash Mountain was so successful in Disneyland, the Imagineers went on to create two other versions of this classic ride. One is in Disney World in Orlando, and the other one is in Disneyland in Tokyo. With its massive land size and ability to create magic on a super-sized scale, it's no wonder Disney World in Florida built their own Splash Mountain in Frontierland. Unlike the Disneyland version where riders sit single file, the Disney World logs seat two in a row. The musical score is also a variant from Disneyland in that the songs are played in a different order. In another departure from the Disneyland version, they use roller coaster mechanics to transport the logs through the brier patch. Opened in the 1990s, the Tokyo Splash Mountain is identical to Disney World, apart from the fact that the first drop at Slippin' Falls takes place inside the brier patch rather than outside. Sponsored by Nissan, the Japanese love this flume ride, and international visitors from all over the world stand in line for their chance to be thrown into the briar patch. 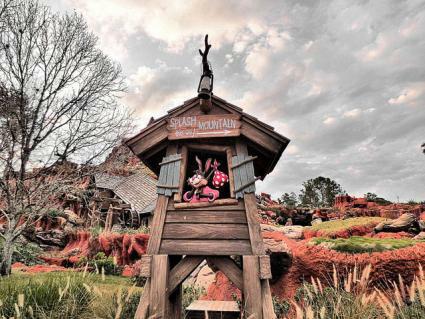 If you are visiting the Disneyland Resort, where the original Splash Mountain resides in Critter Country, you may find you have quite the wait ahead of you. During the hot summer months, Splash Mountain is an especially popular haunt for heat-exhausted guests. However, there are a few ways to experience this popular log ride without spending your whole day in line. Disneyland has a FASTPASS system, in which you make a "reservation" for your turn on the attraction. Simply stick your park admission pass into a FASTPASS machine located in a hub near the ride, and a ticket will be administered with a window of time printed on it. Return to Splash Mountain during that time window, and you will stand in a much shorter line. You can also dodge long waiting lines by visiting Splash Mountain first thing in the morning when the park opens, or late at night when it isn't so warm outside. You may be soaked without the sun to dry you off, but you will breeze through the line and be on your way to further Disney adventures. If you don't want to get too wet, sit at the back of the ride. Otherwise, sit at the front, put your head forward, grasp the rail, and enjoy what Disney labels as a thrill ride. Be prepared; you will definitely get wet on Splash Mountain! In addition to the long flume drop at the end of the attraction, there are a few other smaller dips and drops guaranteed to douse and drench. If you have small children who are afraid of the dark, getting wet, or are easily startled by sudden twists and turns, this ride may not be the best choice for them. Overall, countless guests relish the thrills of Splash Mountain every day at the Disneyland Resort and its sister parks around the world. Check it out on your next visit, and you're guaranteed to leave with soggy socks and a huge smile.